The martial arts world has lost one of its greatest luminaries. Shimabukuro Eizo, Hanshi, passed away on October 22, 2017. For most people, living to the age of 92 is considered most fortunate. However, Shimabukuro O’Sensei was so skilled in karate and so educated on the subjects of wellness, nutrition, and energy that many folks are surprised by this early passing. Truly Shimabukuro O’Sensei embodied the long-lived spirit of the Ryukyus, and the island chain burns a little less bright without his candle. Despite the heavy hearts of his family, friends, and students, we strive to celebrate the impact he has made over multiple decades. O’Sensei was an innovator, dedicated practitioner, and enthusiastic instructor. Many folks in the karate world did not realize the depth of his knowledge, and the value he provided as a pipeline to the old ways of Shorin Ryu. O’Sensei studied diligently throughout the 1930s and 1940s before opening his own Dojo in 1948. 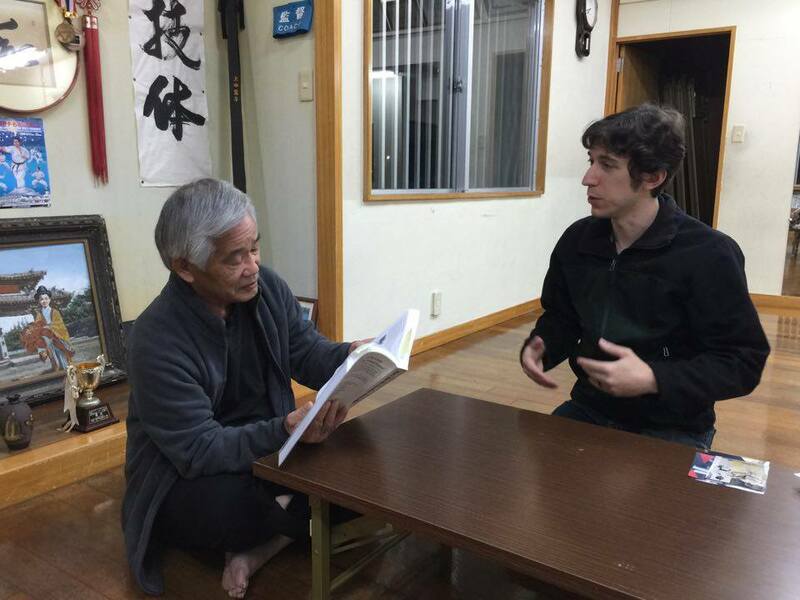 Even after taking on the role of instructor, he continued to refine his own learning by accessing experts such as Chibana Choshin who could add insight into his Shorin Ryu training. Interestingly, the Shobayashi Ryu mantle was pased to young Eizo upon the untimely death of Kyan Chotoku in 1945. The “Shimabukuro Brothers” (Tatsuo and Eizo) wove one of the most interesting tales of karate history. Neither were afraid of innovation and experimentation, which led them to friction with other karate exponents and even against one another. One of the most notable events in O’Sensei’s life was his promotion to 10th Dan by Toyama Kanken. Toyama Sensei was an Okinawan karateka and learned gentleman who found himself in the unique position of representing Okinawan interests in Mainland Japan. Toyama Sensei sent word to Okinawa, looking for representatives of various styles to come together and operate under his organization. Shimabukuro Eizo O’Sensei was the lone individual to heed that call. As a result, Toyama Sensei appointed him as representative and promoted him to Hanshi, 10th Dan. Shimabukuro O’Sensei was 34 at the time, making him the youngest legitimate 10th Dan in karate’s history. Throughout his long, storied teaching career, Shimabukuro O’Sensei’s largest spheres of impact occurred around Camp Schwab and Camp Hansen on Okinawa. He eventually moved his personal residence to Kin Village, just outside of Camp Hansen, allowing him to teach there with great consistency. These dojo(s) melded native Okinawan students with US Military personnel, most frequently United States Marines. As the Vietnam War loomed, more and more American military members were funneled through Okinawa on their way to Vietnam. Shimabukuro O’Sensei became an incredibly important touchstone for some of those men seeking to improve their survival and life protection skills. A handful of special students went on to continue their training with Shimabukuro O’Sensei as best they could, returning to him as their duties and rotations allowed. They took the art of Shobayashi Ryu with them back to the United States and helped establish the style there. My personal connection to Shimabukuro Eizo O’Sensei is secondhand. I never had the opportunity to meet him myself. Yet, his efforts have had a dramatic impact on my training and life. Although I am primarily an Okinawa Kenpo practioner, Shobayashi Ryu has been a crucial supplement to my karate journey. Many years ago I was lucky enough to attend a seminar by Bill Hayes Sensei, who is one of Shimabukuro O’Sensei’s most senior and knowledgeable students. It was that brief exposure to Hayes Sensei that gave me a taste of the “Okinawan Magic” that is so cleverly preserved inside of Shobayashi Ryu. I was hooked, and have strived to increase my exposure to the style ever since. A multi-style gathering led by Bill Hayes Sensei and held at the Hoover Martial Arts Center. Thanks to Hayes Sensei I have had the pleasure of meeting and training with a number of highly skilled Shobayashi practioners, such as Mark Knox Sensei, Tony D’Angelo Sensei, and Tommy Revell Sensei. Once I undertook the writing of “Tales from the Western Generation“, I was also exposed to fantastic individuals like Paul Durso. In 2016 I had the opportunity to travel to Okinawa and meet Shimabukuro Eiko, who is O’Sensei’s son and one of the primary inheritors of his father’s art. It was a pleasure getting to share “Tales” with him and discuss some of his fondest memories of training with the Westerners who came in and out of the dojo. Discussing “Tales” with Shimabukuro Eiko Sensei. I know that without Shimabukuro Eizo O’Sensei’s work to preserve the classical methods of Shorin Ryu, certain segments of knowledge would never have trickled down to me. The scariest thing in karate (and perhaps life) is not knowing what you don’t know. Each time members of the Shobayashi Ryu family show me something new and enlightening, I strive to reserve a moment to thank Shimabukuro O’Sensei for making it possible. Now I’d like to share some remembrances from folks who have had more direct experience with O’Sensei, and who might shed a little more light on the kind of man he was. Please Note: The individuals included in the following section are limited by my personal network. These folks are not the only students of Shimabukuro O’Sensei. There are many other fine practitioners who could elaborate on O’Sensei further. If you, the reader, have some thoughts to share, I encourage you to please leave a note in the comments section below for others to enjoy. Robert Weinberg – Director, New York Rendokan, Inc. I first traveled to Okinawa to study with Sensei in 1972, after graduating from college. At that time there was virtually no information available about Okinawa other than the wonderful history text of George Kerr, “Okinawa: History of an Island People” and a bit of miscellaneous advice from some ex-marines about which bars not to visit. Both proved valuable. When I first arrived in Kin Village (wearing my wool suit in Okinawa’s 90+ degree heat, trying to be respectful) and found Sensei’s home, only his young daughter Michiko, who was about eleven years old at that time, was home. Between my broken Japanese and her limited English, I determined that I was at the right place but that Sensei was not home (It turned out that Sensei was at his farm, a place I would later spend many days learning about animal husbandry, a mystery for a New York City youth). Michiko invited me in and, as I waited in his living room I began to think “The Master did not invite me, is not expecting me, and does not know who I am. He might take offense that I was sitting, uninvited, in his living room drinking his tea with his young daughter.” I quickly took my leave (discretion being the better part of valor) and returned later. Sensei was open and gracious, despite my trepidations, right from the beginning, greeting me with a warm smile and a knowing gaze and made me feel that he was genuinely interested in accepting me as his student. He was not a tall person, but he could certainly fill up a room with his presence! He examined the letter of introduction I had brought from my teacher in the States, Robert J. Infererra (another wonderfully skilled and charismatic teacher) and welcomed me to stay. His family helped me settle into a room attached to the dojo. A little later I was starting my first class. I offered to remove my black belt and start as a beginner, but Sensei said no to that. The class was populated mainly by American Marines from Camp Hansen, right across the street, a few young Okinawan men. As we started the instruction he assigned an American green belt to review forms with me, which I felt was a test to see how I would react. I was just so happy to be there I was thrilled that I had anyone to work with. But here is my first “Aha” moment. I fully expected to see the Grandmaster work with the most senior students attending. Instead, he turned to the beginners, giving them his full attention for the next half-hour or more. I have treasured and always emulated that moment, never delegating the instruction of beginners. Sensei had a special way of focusing on what he was doing and who he was with. When he spoke to you, you were sure that you were the only thing on his mind at that moment. During the next 45 years I would be the grateful beneficiary of that wonderful attention many times over. For Sensei, everything in his life seemed to radiate from his martial art, and, although he was forward looking in many ways, his martial art was at its core about tradition, form, and respect. Indeed the first part of his Dojo Kun states “The form of karate begins with courtesy and ends with courtesy. Respect both seniors and juniors, not only in the dojo but also throughout society.” Everything he did was as a teaching moment, as if it were a kata, with a standard to meet, a method and a skill that could be improved by practice. This was true whether he was demonstrating techniques in his dojo or showing how to wash dishes in his kitchen. Indeed, he named his dojo “Rendokan” or “Practice-Way-Hall” to reflect his strongly held feeling that the practice is itself the key. I have been truly blessed by his teaching. Director, New York Rendokan, Inc. The form of Karate begins with courtesy and ends with courtesy. Respect upper and lower persons not only in the dojo, but also in society. The passing of O’Sensei Eizo Shimabukuro was a painful loss to me. It was like losing a family member. O’Sensei Shimabukuro was much more than a karate teacher to me. As a young Marine stationed on Okinawa, he not only taught me his art of karate, he brought me into his home, became a father figure to me, made me a part of his family, and taught me important life lessons. 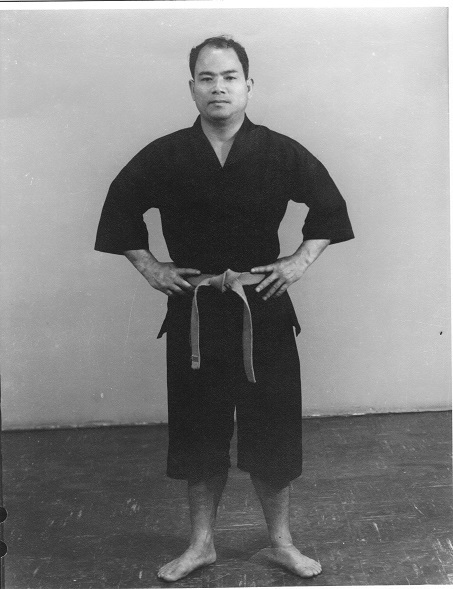 I first trained under O’Sensei Shimabukuro on Okinawa in 1969, again 1970-1971, 1978-1979, and 1982. Training with O’Sensei on Okinawa in those days was very different than training in a modern dojo in the U.S. today. Most of the students were young hard-charging Marines and a few Okinawans. We trained hard, three, four, sometimes five hours every evening and would often spend most of the day at the dojo on weekends. O’Sensei Shimabukuro’s home was always open to us. O’Sensei would greet us with a smile, tell us to come into his home, offer us great Okinawan food, share stories of karate and Okinawan life with us, and listen and offer us wise council concerning any challenges or difficulties we were facing. There are so many wonderful memories of my time with O’Sensei Shimabukuro I could share. There was my first meeting with him in 1969 when he focused his eyes on me and seemed to look right into my soul and how it unnerved me so badly that I had to look away. There was my failed attempt as a “city boy” to help him with his farm animals one day, and how the day ended with his saying to me in a kind fatherly way, “Lee-san, you like to help Sensei? More better you just teach karate.” There was the evening when a fancy high-kicking loud mouth tournament style karate guy appeared in the dojo bragging about how good he was. O’Sensei politely invited him to demonstrate his skills, which he did, and they were impressive. O’Sensei then walked out on the floor and politely asked him to kick him as he had just demonstrated. The visitor, and everyone watching, were in complete awe of how quickly and completely O’Sensei handled the visitor, and without hurting him in any way. The visitor suddenly fell silent, and it was obvious that he was in total shock at what he had just experienced. He departed the dojo quickly and quietly. 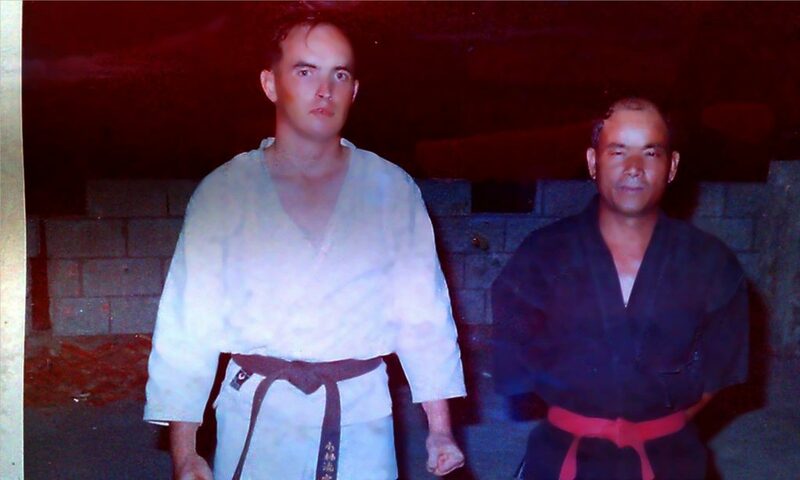 When I began karate training as a teenager way back in 1962, I was told that the main purpose of karate training was to build character, to make you a “better person.” Sadly, I have not seen much “character building” over the years in my karate experience, except on Okinawa. And this brings us to the memory of Shimabukuro O’Sensei that I would like to share. 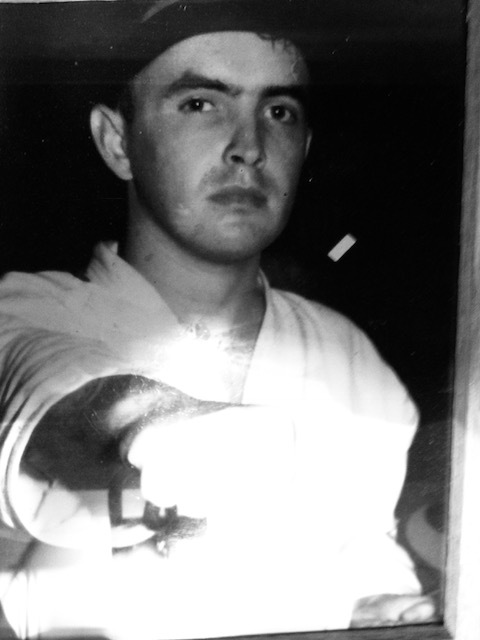 In 1971, I was completing my first tour of duty, and a year of hard karate training on Okinawa. I had been informed that my departure flight date would be the next morning, so that night I walked into town to the dojo to say goodbye to O’Sensei. As I walked down the narrow pathway between the buildings that led to the steps up to the rooftop “sky dojo”, Shimabukuro O’Sensei materialized out of the darkness (he had a way of doing that). I bowed respectfully and told him that I was leaving the next morning for the States and had come to say goodbye. As I waited for his response, I wondered what he would say. Would he show me some “special technique” as a parting gift? Would he reveal a “karate secret” to me? Would he want to “fix” one of my katas one last time before I left? I waited anxiously to see what O’Sensei would do or say. Then he began to speak. “Lee-San, when you return to the States, always be a gentleman. Speak like a gentleman. Say ‘please’,’ thank-you’, ‘excuse me,’ always speak like a gentleman. Always stand and walk like a gentleman. Always move aside and let others pass. Be kind to others. Never, ever strike someone first. If possible, walk away from confrontations. Be soft-spoken, ALWAYS be a gentleman.” These were my teacher’s parting words to me, his final instructions, his gift to me when I left Okinawa as a young man many years ago. His final lesson was about character and about being a “better person,” the main purpose of karate training. It remains the most important karate lesson I have ever had. I, and a few others, were blessed to be close to greatness. Rest in peace O’Sensei Eizo Shimabukuro. Thank you for teaching us. A personal favorite – at the prime of his teaching – the menacing stare, you can feel the speed coming even before he moved and the placement of his left forearm across his chest to protect the core mid-section / heart from a bo, kick, punch…anything. I was a young Marine and my dream to come to Okinawa to train had come true. The decision of who to study with was yet to be decided. Previous training had exposed me to the Ishinryu and Shorin-Ryu styles. I had met with both grandmasters. Tatsuo, founder of Ishinryu, was a legend but in meeting with Eizo I was captivated by his youth. Already the youngest of the Okinawan grandmasters at that time, he showed such depth in his training background from the teachers of classic Okinawan karate i.e. Motobu – Kyan – Miyagi – Itose. It wasn’t until he lifted a floorboard in his home and showed me an old dojo sign, (written in Japanese characters) “I trained with my brother!” he held no secrets to the fact he had tried to work with his brother. On the spot I decided to anchor my loyalty to Eizo Shimabuku. All the world can be a dojo, running on the beach, kumite (with Paul Durso) and water resistant training. He showed a calm, intelligent and diverse approach to karate discipline. When he spoke English he would customize the grammar to emphasize many of his points, i.e., “this karate meaning – more better no push!” The feeling he conveyed was that physical confrontations / fighting could be devastating to an attacker’s health. His training background was diverse and made an impact on my own future training as I was already a judoka and member of the Marine Judo Team. This approach helped me and would impact my training in the years to come as a pioneering mixed martial artist. A favorite move by Sensei – what you don’t see is how his right hand would cross over to an opponent’s right forearm and in one breadth of a move mount to his back and demonstrate how to rip the eyes and ears from the skull of an attacker. This was special to me because Vietnam combat press releases were sometimes unverified or unofficial. I had already experienced Okinawan TV / Radio notoriety and a rumor had spread that I had been killed in action. 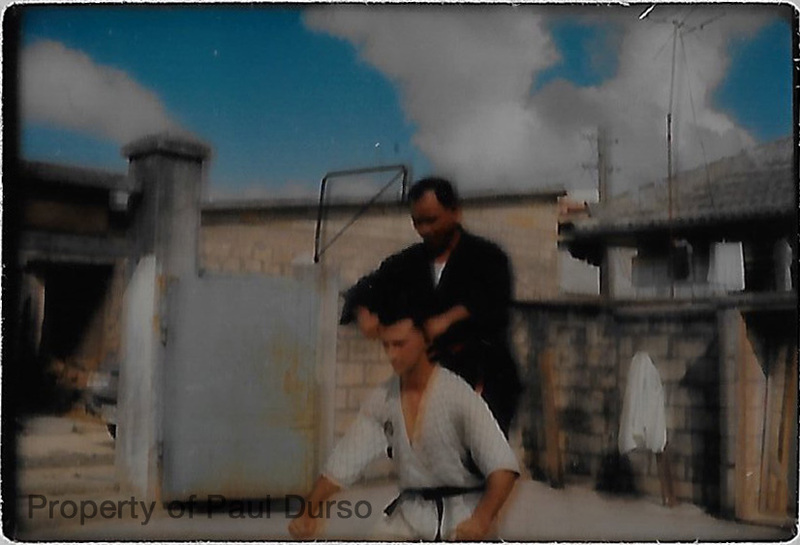 Upon my return to Okinawa in 1966, I appeared in the dojo doorway…but to Sensei and the students, I was a white ghost! Sensei directly exclaimed,”see, Dooso no die!” His emotion will forever stay in my mind because he had trouble pronouncing the “R” in my name DURSO. He had worried, cared, and wondered if I was still alive. He showed that he cared about his students. I was touched, and his emotion will forever stay in my mind. Less than 20 years later Sensei knocked on my door, and before my door had fully opened he was already bowing to me (the polite Japanese custom). My emotions were deep as his dream visit to my home had actually happened. I was humbled that he came. He held a seminar at California State University Fullerton. He spoke, taught, and gave a demonstration. 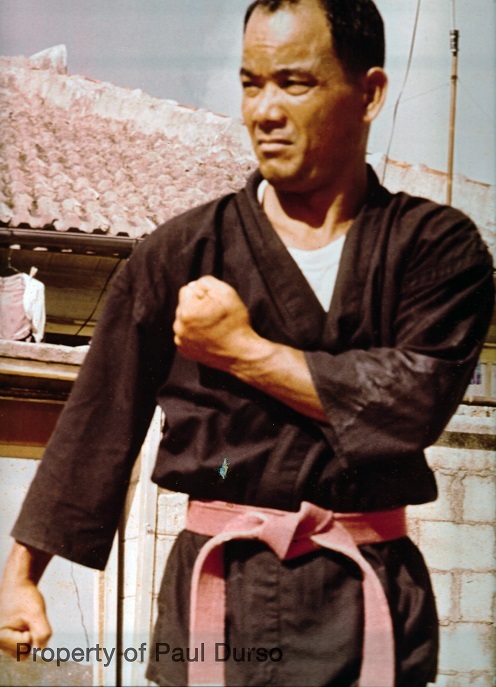 His visit to America showed his foresight and desire to reach out and globalize Okinawan martial arts. 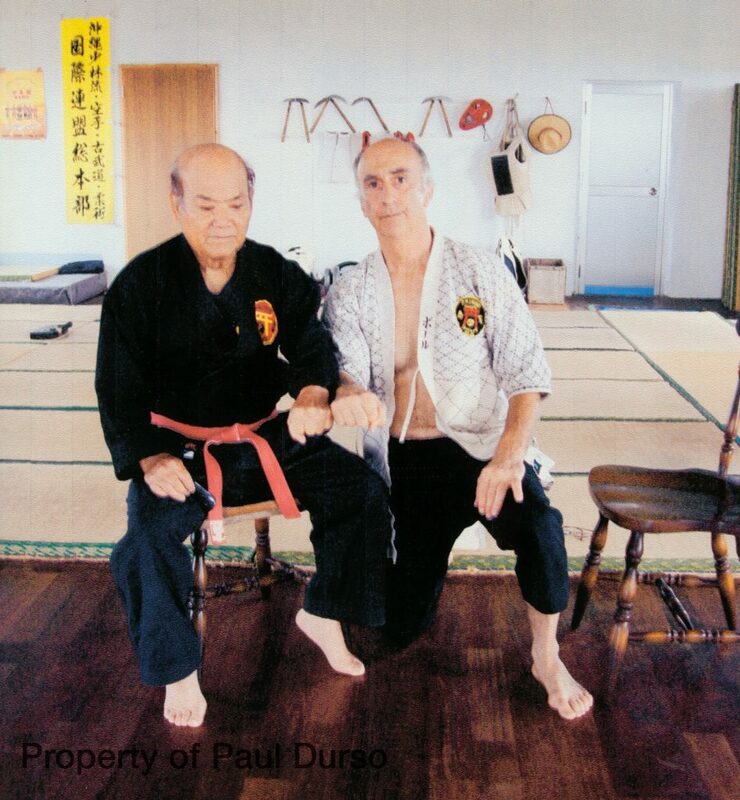 Sensei and (Paul Durso) at his Okinawa home / dojo 2008. A special time/visit to reflect. A trip filled with excitement because I was returning not just as a student to see my teacher but as a seasoned adult, respecting the groundwork he had given me. We were together daily – every newspaper interview, a meeting with RBC (Ryukyu Broadcasting Company) executives and staff – I wanted to share my past success on Okinawa with him. When anyone asked why I had returned yet again, I simply gestured with my hand as I pointed to my teacher. We were interviewed on Radio Okinawa and sentimentally we sang together live on the air a song written by Sensei to honor Okinawan karate history and the bushido tradition. I wanted to share and have him enjoy the spotlight together. After all, Okinawa was his place of birth! . . . his house! . . . his people! . . . I would be gone in a few days – he would remain forever in life and in death. Sensei shared with me privately his final burial place, a family plot that he took me to see. An honor for me that would become closure in his life but never in the values he has passed on to his students. I can only speak of him for myself – Sensei, you gave me much! . . . it takes years to appreciate! I gave you little in return! . . . you will be missed! . . . to that end – I remain your humble student! Just outside the main gate of the Marine Corps base where I was stationed, Camp Hansen, is where I found my dojo. The instructor at “Sky Dojo” (our English translation of the name) was the renowned Grand Master Shimabukuro Eizo. He’d been born in 1925 in the small village of Gushikawa. Famously, he was the youngest man to be promoted to the rank of 10th Degree Black Belt. Impressed by his status, rank, and presence, I realized this was a man I wanted to study with. Miyagi Chojun, the founder of Goju-Ryu, a traditional Okinawan style with a long history. Motobu Choki, one of the greatest and truly eclectic fighters of the time. Kyan Chotoku, known for his speed and severe training practices. This was the place I had to be. A place of promise and history, of honor and discipline. Standing there, looking out on the training floor, I could feel the energy and resolve of those who had come and gone before me. It was a severe place, a humble place. A place that mirrored the Okinawa of old. There were no mirrors, no air conditioning, and no heat. I can neither adequately describe nor sum up my years with Shimabukuro, Eizo, O’Sensei, except to write that his impact on my life has been enormous. The effects of the deadly trauma of Vietnam; violent political unrest at home; lethal backlashes in America over the demand for basic civil rights; a military infested with racists and militants; all acted to squeeze the psyche of individuals such as myself. Okinawa became my oasis and O’Sensei became the center of that oasis – truly I might not have survived without him leading the “way”. I can thank O’Sensei only by continuing his work. This first image shows O’Sensei in 1968 in his prime, as many of us first came to know him. 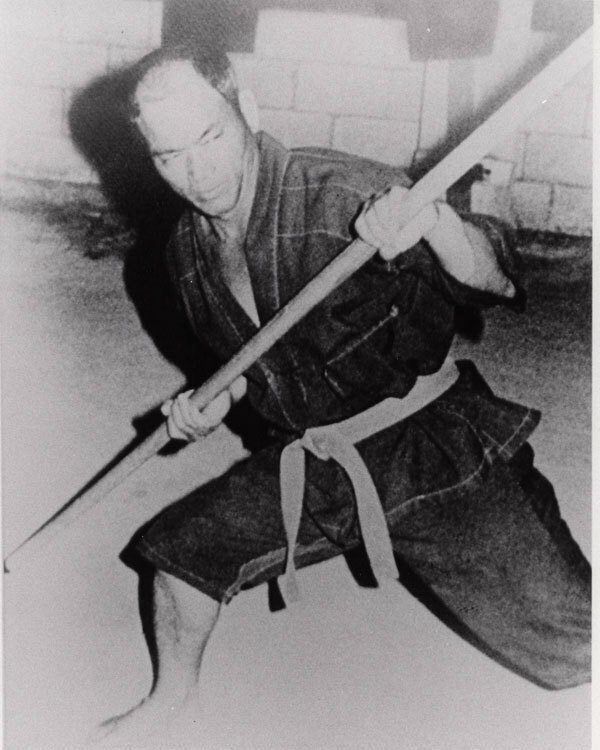 He possessed extraordinary physical talents which were not immediately apparent due to his short stature, but all of which he continually developed and carried into old-age thanks to his attention to the Okinawan diet, rigorous daily personal training (designed to improve his level), and a challenging teaching schedule (designed to improve our level). When you combined that with his comprehensive humanity he became an exceptional model for me and many others. The second jpg I’ve titled, “Goofing in Kin”. This photo was taken in 1968 in one of Kin Village’s several photo studios owned by a friend of O’Sensei. 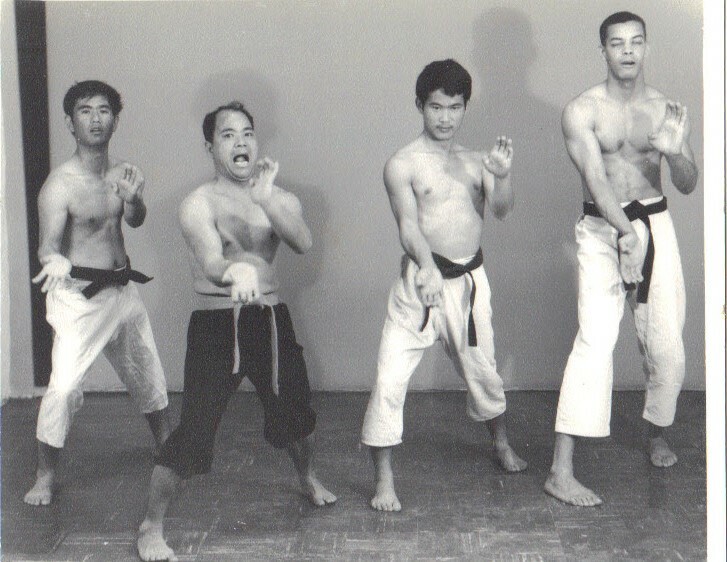 We were in the midst of taking serious training photos designed to illustrate certain aspects of kata when, on a lark, the four of us “posed” for a “goofy Sanchin” picture with each of us showing a major flaw in the ending of kata Sanchin. From left to right: Nobuyuki, Sensei (he taught in OSensei’s northern dojo in Henoko near Nago City); Shimabukuro, O’Sensei, clowning more than any of us at that moment; O’Sensei’s oldest son, Eiko-san, (now 10th Dan and presumed “head of system”); and me with my eyes closed (the obvious “flaw”). As was the case in this day’s training, I was often the only American in the group and learned, heard, saw, and practiced a great many things I otherwise would not have. 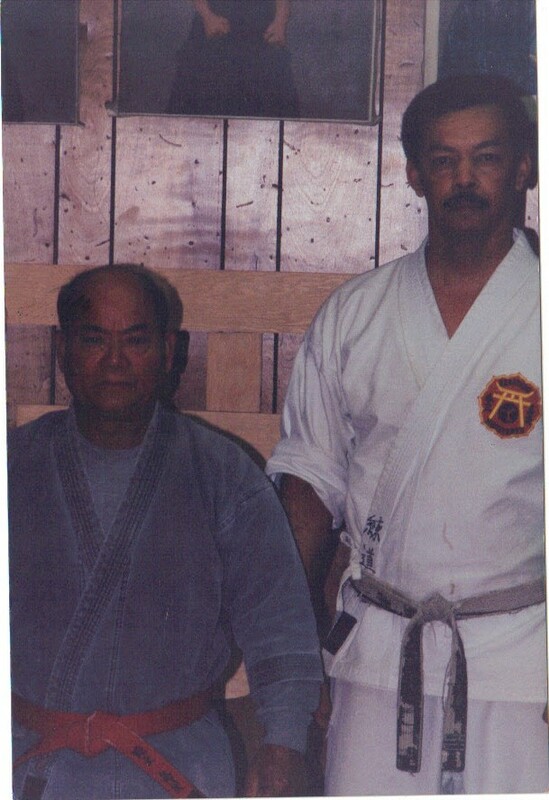 The third jpg is a photo taken in 1994 in the old dojo of Mark Knox, Kyoshi, in Burnham, Illinois, during one of O’Sensei’s occasional visits to America. I had not seen my Sensei in four years and, despite the absence of a smile on either of our faces at the moment the picture was taken, it was a delightful meeting. The weekend was topped off by O’Sensei waking me up before dawn the next morning for some treasured one-on-one “special teach” and apologizing for the miniscule blood stains on the front of my gi (just above my obi in the photo) caused by the prior evening’s training – a memento which implanted the lesson deeply. I encourage folks to share their own remembrances in the comments below.